In spite of the fact that I have not yet knitted up everything I bought when I went to Wonderwool in 2010*, I merrily toddled off to Wonderwool 2012 yesterday with some lovely ladies from Saturday knitting group. This was the first knitting show I'd been to since my last foray to Wonderwool, thanks to my weird ebb in interest in knitting during 2011, and it was very exciting. I went with two purchases in mind: vintage buttons from Brimstone (no website yet), and enough hemp for a summer top from House of Hemp. I think my favourite is the top left - so very unusual. The little ladybird buttons are from the Button Lady, and I have not included in my slightly inept collage a set of 9 smaller Victorian black glass buttons; the haul was definitely a good one. Eagle eyed long-timed readers might recognise the black star button as the very same design to the one I bought at Wonderwool last time and used on my Christmas hat. I sadly broke the one on my Christmas hat using it to hit my friend in a lift (long story) and although I glued it back together I fear I may one day have to replace it; now I can, though this is a smaller version of the design. I did buy some hemp, too, though not enough for a garment. 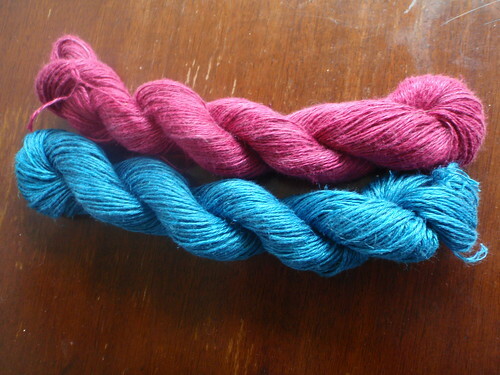 I should have been a bit better planned as I had intended to buy a 500g skein but they didn't have any in the solid colours and I didn't know how much I would need so I bought a skein of 2-ply and another of 4-ply and intend to do some swatching. So, that must be all I bought, right? We started, of course, at Knitwitches where I instantly fell in love with some silk the colour of the Mediterranean in the sun, and some cashmere in a deeper blue, but I made myself come away with just this Merino-Angora blend which was in the sale bin, and which Eirwen calls a light chunky but which would be worsted in any other language, I think. 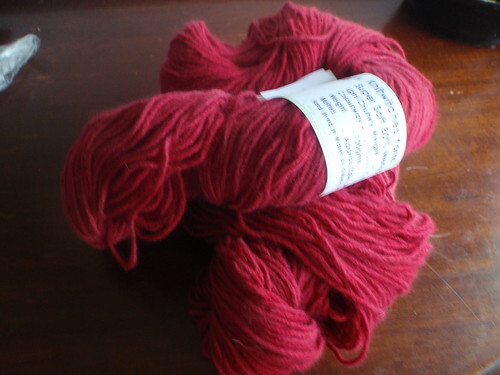 I want to knit some kind of bulky cowl with it; I don't have a red scarf. Sorry about the blurry picture, but the colour is quite true and that's the main thing, right? 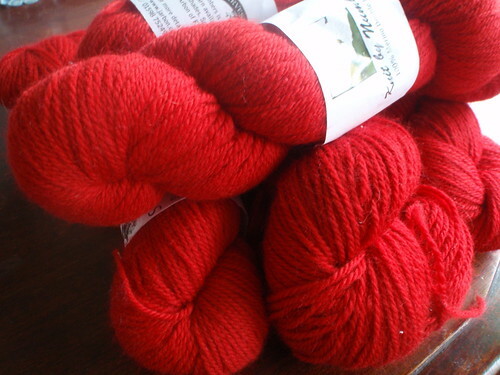 Continuing with the red theme, I bought some Merino DK from Knitting By Numbers. They had an enormous range of shades and a great display - most saturated of the colours at the top with paler version in the rows underneath. Naturally I went for the top row but had trouble deciding between my usual bright blue and a very fetching red. In the end I remembered I had some bright blue mohair I bought last year still waiting for its project, so I went with the red. I have ear-marked this for a Flutter Sleeve Cardigan. Then, on my way to buy some buttons, I saw this winking at me from the edge of a stall. It was quite a splurge but it's OMGSOSPARKLY and I really couldn't leave it behind. The colourway is Deep Water and it reminds me a lot of Lorna's Laces Blueberry Snowcone, which I intended to buy in the Lion & Lamb but the colour's now discontinued in that yarn. And it came with a free pattern. Yes, I am trying hard to justify my splurge. 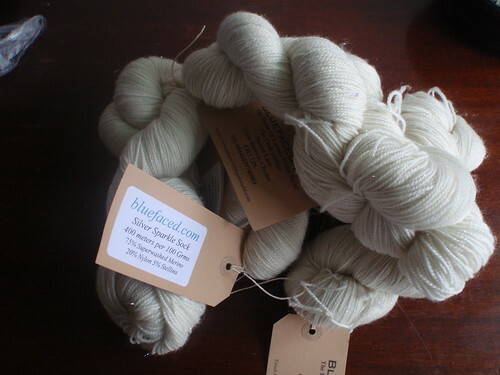 Finally, a last-minute purchase of some sock yarn from bluefaced.com. 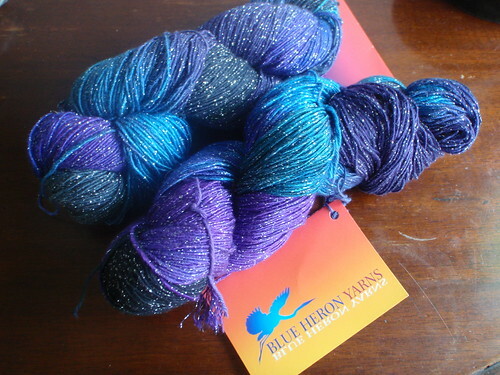 I really liked the subtle sparkle in this yarn but discounted it because, you know, I don't actually knit socks and also the idea of white sock yarn is anathema to me. But then I was peeking at my queue on Ravelry to try and find a good hemp project and I remembered that the Apres Surf hoodie is knitted in sock weight. SOLD. 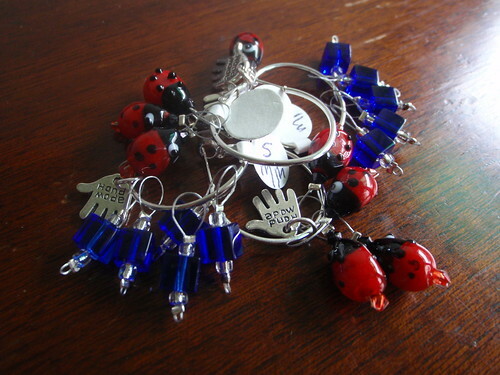 I also got some very cute stitch markers, some earmarked as gifts. That is quite a haul. 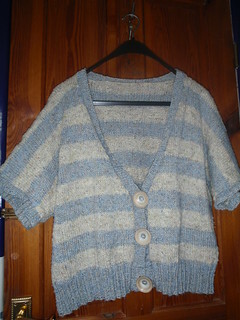 Looking at it is very enjoyable, as is thinking about what I will knit with it. It also inspired me to finish up a project I had OTNs made from stash yarn today: out with the old and in with the new, so to speak. 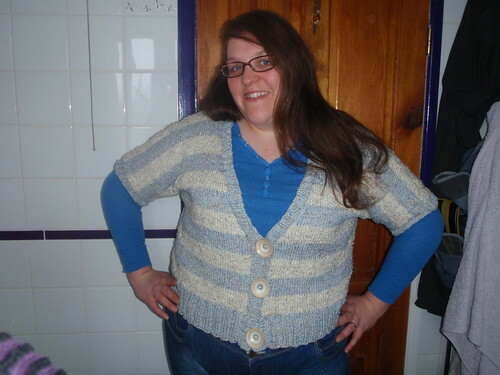 Though if I want to go to Wonderwool next year I had better get a move on with getting this lot knitted up. At least I didn't succumb to the Knitwitches. * Let's be honest here - having looked back over my haul from last time, I realise I haven't knitted up ANYTHING I bought when I went to Wonderwool in 2010, much to my shame, though I have used the roving for thrums on the first of a pair of mittens. 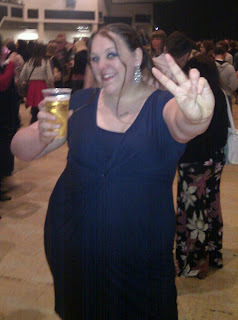 I'd like to tag Peggy for next week's word because she has been away so long! Hope that's OK, Peggy. Last year I posted a list of the places I visited throughout the year. There were a lot of places. I like to travel and have no reason not to; Mr Z is very tolerant of my itchy feet, although it did work out that I spent a little over two months of 2011 out of the country which is a lot, by anyone's standards. This year will be a little different; I intend to spend most of the summer in this country, what with the Olympics and everything (as most people are getting fatigued, I am just getting more excited and inspired by the whole shebang), but I hope to get a fair bit of travel in within the country. And, as it turns out, I have already managed to get about a fair bit. I do so enjoy it! I like the act of travel and the associated places - airports, train stations, ferries; I even like the long coach journeys of the school trips - nearly 24 hours for skiing, though it was less this year thanks to some amazing coach drivers. I think it's because when I'm travelling, I don't have to worry about being idle, because I am already busy - travelling. Plus I like to see lots of new things. Some things more than others. Speaking of travel, I am off to Builth Wells tomorrow for Wonderwool, so I had better close this entry here. I will keep adding to my map as the year passes, so keep checking in if you so desire! This week's Weekword is one very close to my heart: TRAVEL. Capri in February....I kept waiting for the half naked man with the washboard abs to pop out in his rowing boat and invite me to film the new D&G advert with him but there was only an aging fisherman on a boat seemingly propelled by a chugging cloud of diesel smoke, and I was not desperate. Regular readers will know just how spoilt I have been in the past couple of years with travel opportunities, and I thought it would be nice to read some other people's views on travel, in whatever form it takes. So, if you would like to take part, please leave a comment on this blog before Friday, make a post on your blog on Friday about the word TRAVEL, and I will post a list of participants together with my response. Congratulations, ladies, on creativity under time pressure! I hate being late. I am the person who is three hours early for the flight. I get to school half an hour early in the morning because I insist on leaving by 7.15am in case there's traffic. I can be spotted hanging around outside a shuttered Get Knitted on the first and third Saturdays of most months, because I turn up for Knatterers before they open. Awkward. It wasn't always this way. I was always late for school as a child; I couldn't imagine being a teacher and having to be there early - quelle horreur! Mother Hand runs to her own times and was late for my wedding because she insisted on eating a sandwich first, much to the incredulity of my in-laws (it was OK though, I was 15 minutes late also, for reasons which I can no longer recall). But I think the shame of having to walk into places in front of everybody flicked a switch in me some time in my very late teens and now I make the effort to be early. I wish I could say the same for completing tasks, though I am better in this respect than I used to be, also. I am pleased to say that I managed to mark all the GCSE assessments in the Easter holidays which is fully a month before the deadline, thanks to a little regular weeknight date online with some colleagues for a shared marking experience. It's also easier to make myself do the marking when I know I'm going to have to see disappointed faces the next day, if it's left undone. It is something that comes later in life, though. Perhaps after enough humiliation. One of my A2 students was 7 weeks tardy with his essay, and I had to bring out the big guns to get him to complete it. Alas, he had left it so late he resorted to copying and pasting large chunks of text from Wikipedia. Awk. Ward. After a shaming like that I think I'd never leave anything to the last minute again. This post was brought to you by weekword. To play next week, please check back with my blog on Monday when I will post a new word on which you should ruminate by Friday. I hope it's OK for me to pick two weeks in a row!